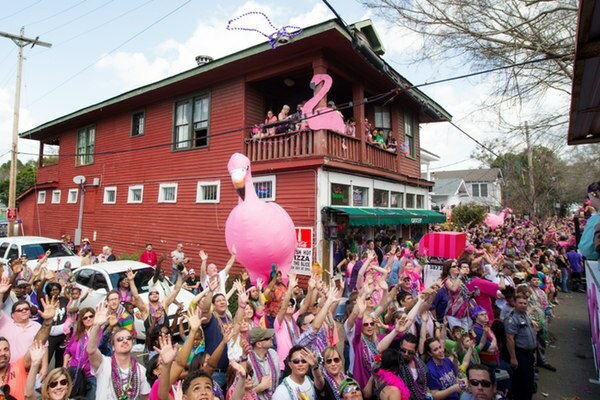 File photo of the Spanish Town Mardi Gras parade. Some Spanish Town residents and civic leaders are concerned about the recent sales of several homes in the historic neighborhood that appear to have been purchased strictly for the purpose of leasing out to short-term or vacation renters. At this morning’s Downtown Development District meeting, DDD commissioner Cheryl McCormick, a longtime Spanish Town resident and property owner, told Metro Council member Tara Wicker that neighborhood residents hope to meet with her soon to discuss what they see as a growing problem with properties being flipped for use as Airbnbs. McCormick declines to point to specific properties of concern, but longtime Spanish Town resident Marie Constantin, a photographer who does freelance work for Business Report, says two houses in the 600 block of Spanish Town Road and one on N. Seventh Street have changed hands in recent months and are either being used by short-term renters or are said to be under renovation for that use. Owners of the properties, including a Baton Rouge based-company called Pinnacle Homes and Properties, could not be reached for comment to confirm neighborhood residents’ assertions. But Constantin says she has seen an increase in her area of short-term renters—easily identifiable by the luggage they carry—and has noticed the neighborhood’s already scarce parking becoming even tighter. Wicker says she is following developments in New Orleans, which banned short-term rentals in the French Quarter in 2017 and is considering such a ban in the Garden District. The City Council has also given a preliminary nod to prohibiting whole-home rentals in all residential zones in the city. Wicker says it’s way too soon to suggest she would try to enact such a measure here but she says she looks forward to sitting down with her constituents in the area. Current zoning regulations allow for short term rentals in Spanish Town, most of which is zoned A4, according to Planning Director Frank Duke. Airbnb spokesperson Laura Rillos says the company is willing to work with local government, as it has in cities throughout the country. “We are committed to working with the City of Baton Rouge, like we’ve worked with hundreds of governments around the world, on fair rules that allow our hosts and the city to receive the full economic benefits of short-term rentals, while protecting neighborhood character,” she says.